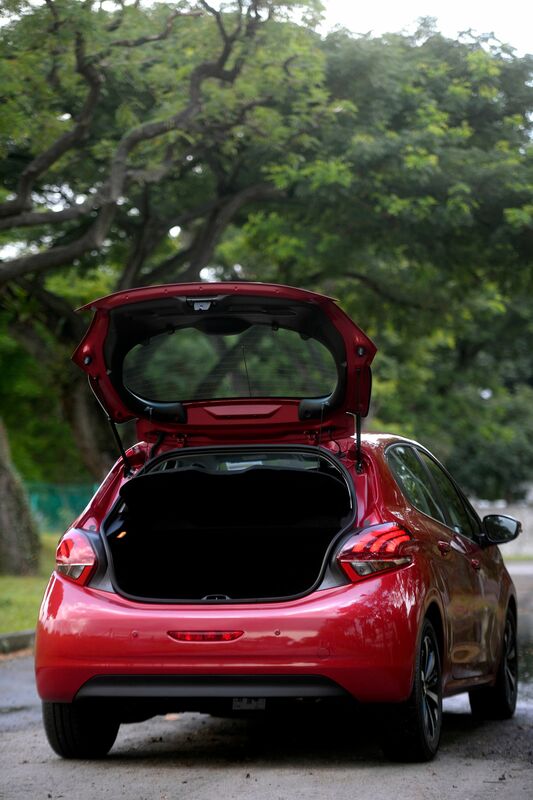 The Peugeot 208 is a small car that is big on ride comfort and easy handling. But before you race Uber to the showroom, there is more you should know about this French number. Firstly, it has incredulously tinny doors for a European car. They shut with the hollow din of a Japanese model produced 20 years ago. Maybe it has to do with the new carbon consciousness that is sweeping Europe. The Polo-sized 208 1.2 PureTech weighs just a shade over a tonne, making it as light as what you would expect a Japanese equivalent to be. This incredible lightness makes the 208 a fuel sipper and a low emitter of CO2. At 104g/km, the cheerful hatch qualifies for a $15,000 carbon rebate. To earn a fatter rebate, you would have to drive a hybrid such as the Toyota Prius or an electric model such as the Tesla Model S (make sure it is a brand new one, though). For this reason alone, tinny doors are forgivable. Secondly, the 208 is now equipped with a proper automatic transmission, from renowned Japanese components maker Aisin, no less. It is noticeably less jerky than the robotised manual which its 1.6-litre turbodiesel twin was equipped with three years ago. But it is not as smooth as what you would expect a car fitted with an Aisin gearbox to be. Things are dandy if you are driving leisurely, with spring flowers blooming on your right and left, a painted artist playing the accordion at the corner bistro and the Eiffel Tower in the distance. But in the mini grand prix that takes place on every paved tarmac in Singapore, the 208 1.2 becomes a bit of a laggard. There is a starchiness to its operation, as if a pastry chef had wandered into a Peugeot production line, spilled a tub of wet dough into the engine assembly and muttered c'est la vie with a shrug before strolling off. The Ford Fiesta 1.0, which, like the 208, has a three-cylinder engine, is so much smoother and driveable in every conceivable situation. Yet, for the record, the Pug is swifter than the Fiesta as well as the turbodiesel 208. In fact, it is also quicker than similar subcompacts such as the Mazda 2 and Volkswagen Polo. It just does not feel so at the wheel. Unless you floor it like Luc Besson in the 1998 movie Taxi. But if you do, you will not get the fuel frugality Peugeot promises. Actually, to get the promised frugality, you would probably have to drive like Morgan Freeman in Driving Miss Daisy (1989). Otherwise, the 208 is not difficult to live with. It is blessed with the best steering in its class - super sharp and with zero free play. The car handles well, and yet has the superb ride quality of a far bigger car. It is also packed with goodies, including a 7-inch multi-function colour infotainment touchscreen, six airbags, steering-mounted controls (at last), air-conditioned glovebox, automatic rain and light sensors, and an anti-glare rear- view mirror. It is kind of cute, too. Now, rush to the showroom if you are still keen.